Below is a list of Australians of Lebanese heritage who served during World War One. They are represented in all Australian campaigns including Gallipoli. Some were killed in action, some wounded and some were prisoners of war. As well, a number of other Australian Lebanese tried to enlist but were discharged for reasons such as being under age or medically unfit. Richard Lahood was discharged as an enemy alien, a Turkish subject. Some enlisted too late to be posted overseas. Private James Callel Ferry, for instance, was one of the first Australians to enlist 17th August 1914. He saw active service at Gallipoli and on the Western Front. Luck was on his side because he survived to return to Australia in May 1919. Private Vincent Mahboub of the 35th Battalion AIF enlisted on 15th June 1917 but was killed in action on the 8th August 1918. He was the son of Michael and Rosie Mahboub, of Excelsior, New South Wales and was born in North Lebanon. Sergeant Walter Abotomey embarked with the 1st Battalion, as a Private, aboard HMAT Orsova (A67) on 14 July 1915. He served at Gallipoli as a temporary corporal from October 1915 until evacuated with influenza a few weeks later. From August 1916 he served in France with the 61st Battalion and 1st Battalion. He was wounded in action in October 1917 and promoted to corporal. In December 1917 Cpl Abotomey was selected, along with other members of the AIF, to serve with ‘Dunster Force’; a special force established to reorganise resistance to enemy advances in Mesopotamia and Persia. In March 1918 he was promoted to the rank of sergeant. In May Sergeant Abotomey was diagnosed with severe tuberculosis. He returned to Australia in March 1919 where he died on 1 October 1920, aged 27. Private Michael George Antony was born in Adelaide to George and Touminie Antony from Aintourine in Lebanon. He enlisted in April 1916 and joined the 5th Infantry Battalion. He enlisted under the name “Michael George” with the enlistment number 6266. He was killed in action at Bullecourt, France on the 10th May 1917. Records differ on his surname. The digitised National Archives of Australia file lists “Michael George”, but the Australian War Memorial lists him as “Michael Antony”. Under the Arabic system, as son of George was Michael George, but the Anglo-Celtic system would have taken his father’s last name as a hereditary surname. 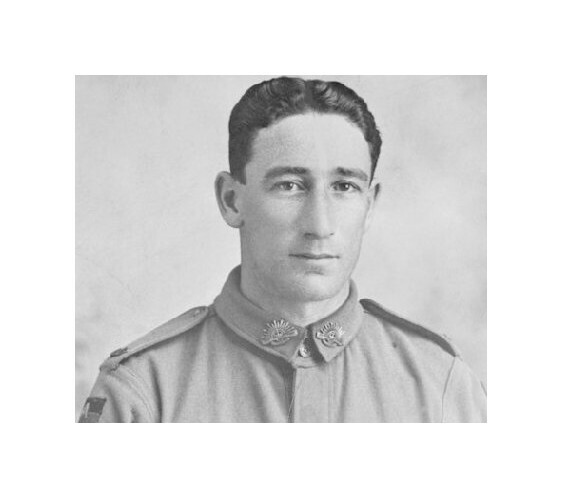 Private Edward George Shala, born Bourke NSW was an electrician prior to enlisting on 26th April, 1917 and was discharged in England on 17th April 1919. He was with the Australian Flying Corps, Aeroplane Repair Section. When discharge in England he quickly found a job with a British company, R. A. Lister & Co. Ltd. In their electrical department for six months then transferred back to Australia with his wife (whom he married in England) and worked with the same company in Sydney. His father was George Shalala, born in Ramoon, Mount Lebanon who applied for this Naturalisation Certificate in 1924 and gave his address as “hawker”. Second Air Mechanic John Mellick from Rockhampton, served on the Western Front in the air corps. Private Vincent Lahood, while serving on the Western Front, was captured by the Germans and spent time as a Prisoner of War. Some, like Private John Mansour, completed their active service, in his case in France, and rather than return directly to Australia, took the opportunity of visiting their home villages in Lebanon. 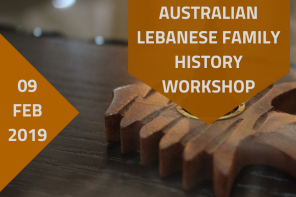 The list is not exhaustive and the Society is anxious to hear of any other Australians of Lebanese heritage who served with the armed forces during World War One, and/or their photographs. Newsletter No. 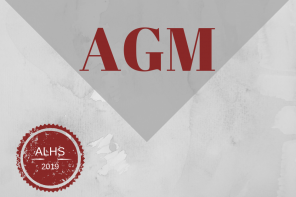 49 2014 of the Australian Lebanese Historical Society Inc. Newsletter No. 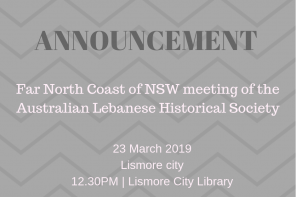 51, 2015 of the Australian Lebanese Historical Society Inc.
Collection of the Australian Lebanese Historical Society Inc.